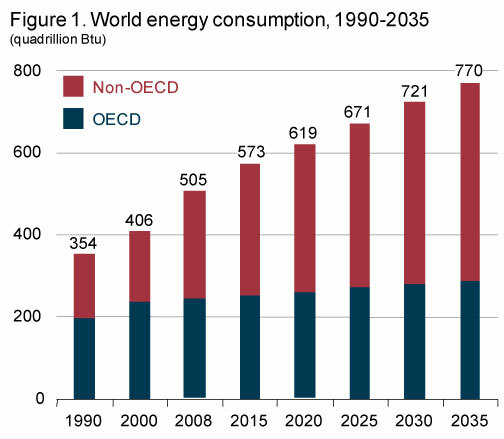 In the IEO2011 Reference case, which does not incorporate prospective legislation or policies that might affect energy markets, world marketed energy consumption grows by 53 percent from 2008 to 2035. Total world energy use rises from 505 quadrillion British thermal units (Btu) in 2008 to 619 quadrillion Btu in 2020 and 770 quadrillion Btu in 2035 (Figure 1). Much of the growth in energy consumption occurs in countries outside the Organization for Economic Cooperation and Development (non-OECD nations) where demand is driven by strong long-term economic growth. Energy use in non-OECD nations increases by 85 percent in the Reference case, as compared with an increase of 18 percent for the OECD economies. Although the world continues to recover from the 2008-2009 global recession, the recovery is uneven. In advanced economies, recovery has been slow in comparison with recoveries from past recessions. Unemployment is still high among the advanced economies, and real estate markets and household income growth remain weak. Debt levels in a number of small economies of the European Union—Greece, Ireland, and Portugal—required European Union intervention to avert defaults. Concerns about fiscal sustainability and financial turbulence suggest that economic recovery in the OECD countries will not be accompanied by the higher growth rates associated with past recoveries. In contrast, growth remains high in many emerging economies, in part driven by strong capital inflows and high commodity prices; however, inflation pressures remain a particular concern, along with the need to rebalance external trade in key developing economies. Beyond the pace and timing of the world's economic recovery, other events have compounded the uncertainty associated with this year's energy outlook. Oil prices rose in 2010 as a result of growing demand associated with signs of economic recovery and a lack of a sufficient supply response. Prices were driven even higher at the end of 2010 and into 2011 as social and political unrest unfolded in several Middle Eastern and African economies. Oil prices increased from about $82 per barrel3 at the end of November 2010 to more than $112 per barrel in day trading on April 8, 2011. The impacts of quickly rising prices and possible regional supply disruptions add substantial uncertainty to the near-term outlook. In 2011, the price of light sweet crude oil in the United States (in real 2009 dollars) is expected to average $100 per barrel, and with prices expected to continue increasing in the long term, the price reaches $108 per barrel in 2020 and $125 per barrel in 2035 in the IEO2011 Reference case. The aftermath of the devastating earthquake and tsunami that struck northeastern Japan on March 11, 2011—which resulted in extensive loss of life and infrastructure damage, including severe damage to several nuclear reactors at Fukushima Daiichi—provides another major source of uncertainty in IEO2011. The near-term outlook for Japan's economy is lower than the already sluggish growth that was projected before the events, but the impact on the rest of Asia and on world economic health as a whole probably will be relatively small, given that Japan has not been a major factor in regional economic growth in recent years. However, the event may have more profound implications for the future of world nuclear power. The IEO2011 projections do not reflect the possible ramifications of Fukushima for the long-term global development of nuclear power or the policies that some countries have already adopted in its aftermath with respect to the continued operation of existing nuclear plants.